As part of Chorlton Arts Festival we are hosting another short-short story competition. We’re looking for stories of 500 words or less. Find a pen and get writing! Closing date is Friday 27 April. There will be prizes for the winners and the chance for winners and runners-up to read at our live final during Chorlton Arts Festival on Wednesday 23 May. Pop on over to our #Flashtag Writing Competition site and have a look at the rules and how to enter. We look forward to seeing you flash! The FlashTag writers Sarah-Clare Conlon, Dave Hartley, Benjamin Judge, Tom Mason and Fat Roland will soon be taking their potty mouths up north and teaming up with Quickies contributor Kim McGowan to storm the stage at Word Soup, presented by Lancashire Writing Hub. They’ve even named the night with a nod to our anthology, which is rather nice. 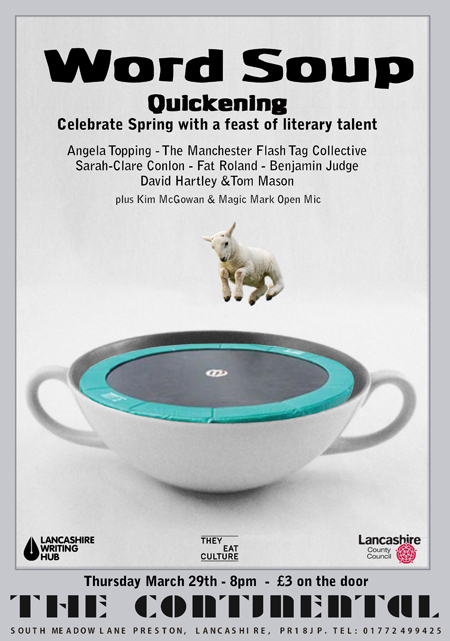 Word Soup: Quickening – Thursday 29 March 2012 – 8pm – £3 on the door – priceless entertainment – The Continental, South Meadow Lane, Preston PR1 8JP. More on the LWH website.